The only way for Erdogan to have greater influence over Europe and protect Muslims in European countries is to re-establish the Khilafah state (Caliphate) on the way of the Prophethood. Indeed, since the time of Haroon Rashid to Abdul Majeed, the Khilafah state was able to do both. 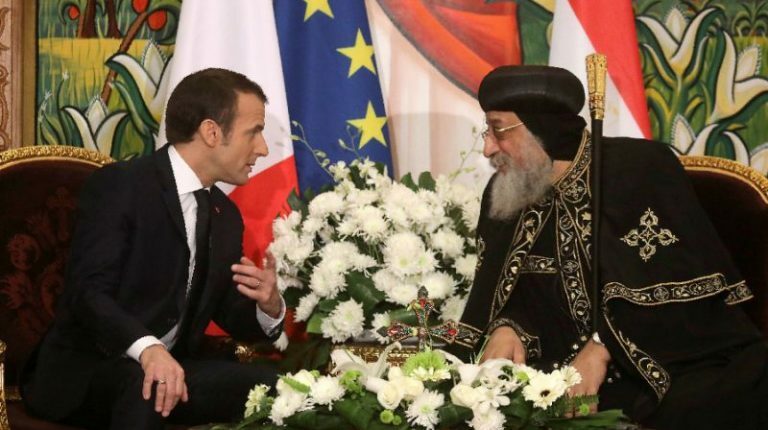 French President Emmanuel Macron met on Tuesday with Egypt’s top clerics and called for inter-religious dialogue at the end of a three-day visit aimed at boosting ties while raising human rights concerns. Macron and Pope Tawadros II stressed the need for “dialogue between religions” as he met with Pope Tawadros II at St Mark’s Cathedral, seat of Egypt’s ancient Coptic Orthodox Church. “I decided that a new conference will be held in Paris to see how to act more effectively,” he said, without giving details.A diplomatic source said the French capital would host a forum on religious minorities in the Middle East, but without giving a date. Macron visited the church adjacent to the cathedral that was the site of a December 2016 jihadist attack which killed 29 people.He also met in Cairo with Ahmed al-Tayeb, the grand imam of Al-Azhar, the most prestigious seat of Sunni Islamic learning in Egypt. Their talks centred on “the training of imams (prayer leaders) in France and the fight against the misguided vision of religion”, the French presidency said. On Monday, the human rights situation in Egypt was at the centre of talks between Macron and Egyptian President Abdel Fattah al-Sisi. Their different visions were on show at a joint news conference where Macron said respect of freedoms was inseparable from stability while Sisi said security was the priority for Egypt’s 100-million population. [Source:News24]. Egypt does not need dialogue on religion, it needs emancipation from Western slavery through the establishment of Khilafah Rashida. Under the Khilafah, Egypt was the bulwark against the expansion of the crusades and eventually uprooted the crusades and expelled them from Muslim lands. Today, under Sisi, Egypt is eager to give crusaders like Macron greater authority over Egyptian affairs. Despite announcing the budget, the mini budget and debasing the rupee, the government is now raising interest rates. Raising interest rates makes borrowing expensive, dissuades economic activity and increases unemployment. Throughout these policy measures, Imran Khan’s government has maintained the façade of independence but the reality is that IMF is dictating Pakistan’s economic policy. This has been the case since the early 1980s, and the IMF has eroded Pakistan’s economic sovereignty. Yet IK wants Pakistanis to believe that he will turn things around.